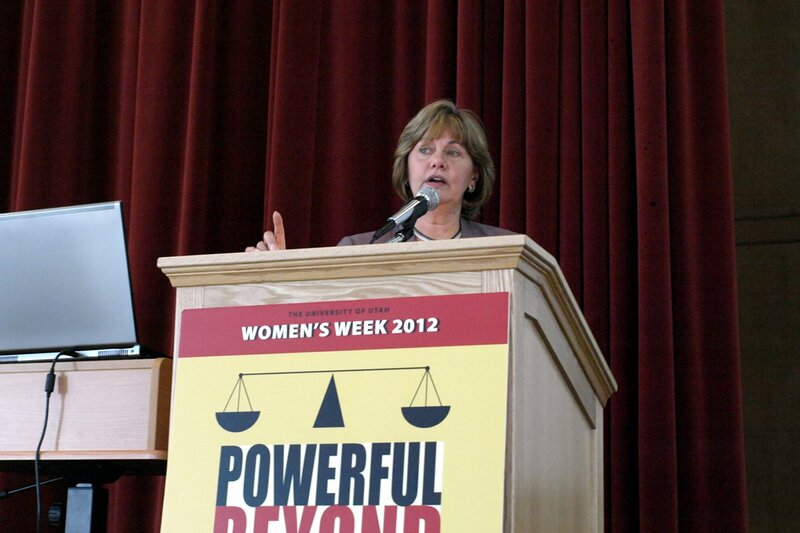 President Cynthia Bioteau, Salt Lake Community College’s first woman president, was the keynote speaker at the University of Utah’s Women’s Week celebration on Wednesday March 21, 2012 at the UofU’s Olpin Student Union Ballroom. The UofU hosts this annual event that coincides with Women’s History month in March. Women’s history month began in California in 1978 as a way to hear more of “her story” in “history” and to celebrate the legacy and achievements women have made in society. The purpose of this event is to bring women in the community together, to celebrate their accomplishments and to inspire. “I thought [her speech] was captivating, engaging and surprisingly really motivational,” says Alana Kelly, a former SLCC student who recently transferred to the UofU. President Bioteau is the 7th president of SLCC and is the college’s first woman president. Since becoming the president of SLCC in 2006, she has been an integral part of many great advances at the college, especially when it comes to helping women succeed in life and the business world. She supported the creation of the Women’s Business Institute at the Miller campus and instituted the Women’s India trust fund that supports women entrepreneurs in India. The theme of Women’s Week this year, “Powerful Beyond Measure: Women, Work and Education,” with an emphasis on education. President Bioteau has had an extensive background with over 35 years of experience in education, mental health and business, contributing to communities and enriching lives of young people. President Bioteau began by calling her address a ”spurnote” address, hoping that her speech would lead to conversations that spur each other’s thoughts to action. She explained that how she sees and understands the world is through the telling and hearing of people’s stories. She showed videos of SLCC students telling their stories about going back to school and the difference it has made in their lives. She also showed a YouTube video called The Girl Effect, which is a movement to end poverty by investing in girls. She used this as an example of the powerful effect education has on a society, especially when women are educated. President Bioteau went back to school at 45 to receive her doctorate, after taking time to raise her kids as a stay at home mom. Many of her colleagues warned her of the difficulties of returning to her fieldbut she made it her goal to receive her doctorate before she turned 50. She said that at 49 and a half, she walked across the stage and was hooded. Her story exemplified that it’s never too late to go back to school. She shared her story of going back to school to show the importance of education in her life and in the life of her family. She used an example of educate as a verb, educated as an adjective and education as a noun and how each are applicable and crucial in improving lives. She also expressed the importance of sharing that knowledge with others, in helping others grow and become successful, showing the power that education brings. She encouraged everyone in the room that they have a duty to not only educate themselves but everyone around them, that there is a power and responsibility that comes to those who are educated. She explained what it means to her to be educated in sharing a quote from Marcel Proust, “The real voyage of discovery consists not in seeking new landscapes but in having new eyes.” She challenged the audience to think of one person they could share their knowledge with to help empower them. It is our light, not our darkness that most frightens us. We ask ourselves, Who am I to be brilliant, gorgeous, talented, fabulous? Actually, who are you not to be? You are a child of God. Your playing small does not serve the world.